ADULT AERIAL ARTS: Take your fitness and flexibility training to new heights. Join us as we explore movement with the aerial silks, aerial hammocks, aerial slings & aerial hoop Focusing on core, upper body strength & confidence building. Beginner classes available. No Prior Experience Required. 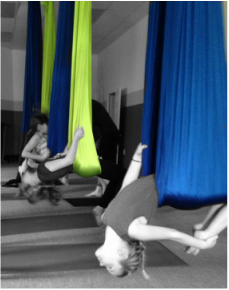 ​This class differs from our Aerial Arts classes as we focus on using the aerial hammock as a prop to help deepen our practice. Aerial Yoga incorporates postures from floor-based yoga practices with a little Hatha, Vinyasa, Power, and Restorative yoga styles. Emphasis is placed on deep stretching, decompression of the spine, core engagement, strengthening, and inverting safely. Limit is 5 people per class. Be sure to reserve your hammock by clicking the 'Register Now' button below. Featured on WCVB Channel 5 Boston Chronicle "Mystery Main Streets"